ACE Spectrographs – Astronomical Consultants & Equipment, Inc.
Astronomical Consultants & Equipment, Inc. ACE has over 25 years of experience in the design and manufacture of research astronomical spectrographs. 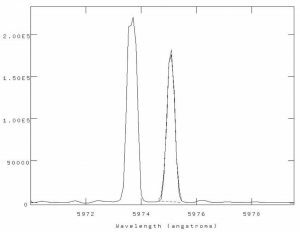 We have deployed both classical spectrographs mounted at Cassegrain focus and fiber-fed echelle spectrographs with remarkable efficiencies. Our spectrographs can be found at Kitt Peak, Cerro Tololo, Mt. Graham, and in Europe. All systems are customized to match the telescope optical system. Details for an f/7.5 Cassegrain are given below. The performance of the system depends heavily on the type of detector integrated into the system. For best results a CCD cooled to -100C is deployed. The front end is attached to the telescope. It is actually a module that inserts into the ACE Dual filter wheel / guider box. That is a multi-purpose instrument that allows direct imaging through a set of two stacked filter wheels. A diagonal pick-off mirror is mounted on an X-stage guider. 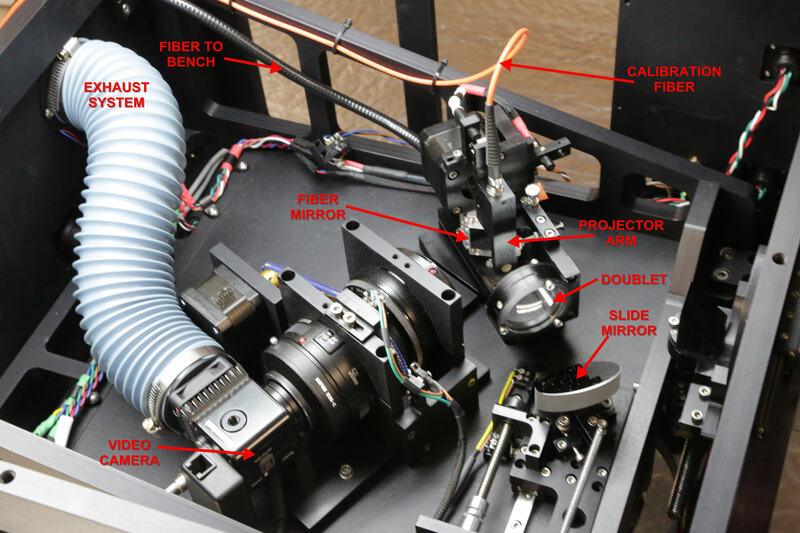 Light is directed to a guider camera that allows auto-guiding in both direct imaging and spectrographic modes. By moving the stage a large swath of sky is available for finding a guide star. So the spectrograph front end is a module that slides into the direct imaging instrument box. It is easily inserted and removed for maintenance. An annotated image of the front end is presented here. A diagonal slide mirror can be moved into the beam to direct light into the spectrograph, blocking the direct imaging camera. Swapping from direct imaging to spectrographic mode takes less than 10 seconds. The entire instrument is designed for autonomous operation or remote controlled operation. Light from the slide mirror passes through a doublet lens and the target comes into focus on the fiber mirror. The fiber mirror serves two purposes. First, the spectrograph fiber is embedded into the mirror. Second, the surrounding field on the fiber mirror is imaged by a video camera or CCD camera to allow the object to be centered on the fiber. The spectrograph pages are being built this week. Please check back soon for full update or call 520 219 8722 to speak with a design engineer. Copyright © 2019 Astronomical Consultants & Equipment, Inc.. Powered by WordPress. Theme: Spacious by ThemeGrill.